Mary Marcia Brown has worked in the health and fitness industry for more than 15 years. A writer and runner with road race directorship experience, Brown has been published in "Running Journal," "Florida Running & Triathlon" and "Outreach NC." Running is not a sport reserved for the young and elite. It is a lifetime sport that allows you to continue to challenge yourself for decades. With "Senior Grand Masters" divisions being recognized in many road-racing venues for runners 60 and older, and with standard age-group recognition, running can also allow you to be a competitive athlete for life. 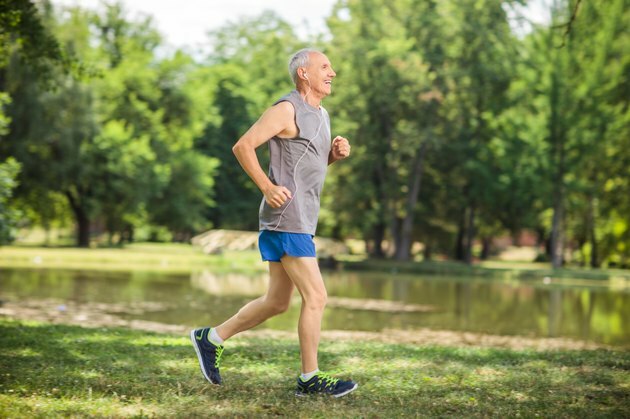 To safely run with strength and speed in your 60s and beyond, understand the physical effects of aging on your sport and train appropriately to be the best runner you can be. After age 35, you lose 1 percent bone mass each year. By age 70, you will have naturally lost 40 percent of your muscle mass and 30 percent of your strength -- if you do not strength train. Because your lower body is impacted more by this loss, strength training is crucial to your running performance, especially as you age. If you have not done strength training in the past, start by doing one set of muscle-strengthening exercises two to three days each week. Lunges are an effective choice for your lower body, and pushups target more muscles in your upper body. The natural loss of fast-twitch muscle fiber and the age-related decrease in stride length will cause you to run slower in your 60s. Although strength training will help minimize fast-twitch muscle fiber shrinkage, hill training is important for increasing your stride length. Include hill training one day each week to strengthen your calf muscles and improve the power of your leg drive. This will lengthen your stride and improve your speed. As you age, you have a lower proportion of body water. Hydration is even more important in your 60s and later. This is especially true if you are running outdoors as you are less adaptable to temperature changes. Drink water before and after you run. Have a water bottle handy if you are running indoors on a treadmill, or consider investing in a water belt when you run outdoors. Although you can certainly run with strength and speed at 60, you will likely not be running with the strength and speed you ran with at 20. Set running goals that are realistic for your current, personal fitness level. Talk to your doctor about how your personal physical health will affect your running schedule. Set running goals with a personal trainer or running coach. Warm up before your runs and stretch afterwards. Most of all, lace up often, have some fun and enjoy logging your miles for a lifetime.